At CES, the Intel CEO "showed off a demonstration of a mobile Internet device that will one day soon provide simultaneous voice translation as well visual translation of foreign signs and text." 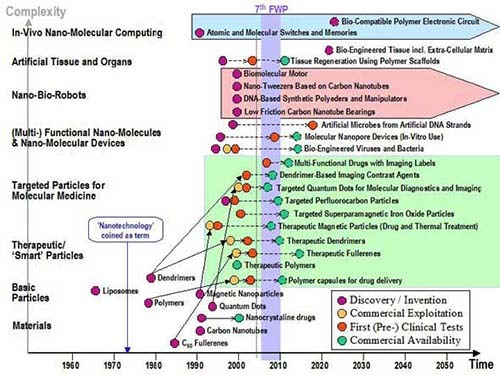 "Nanotechnology job projections are estimated to be nearly two million workers worldwide by 2015. In addition, nanotechnology will create another five million jobs worldwide in support fields and industries." "Future for High-Paying Jobs is in Nanotechnology"
"In 2020, nanotech will be an important part of the manufacturing base--every industry will be converted or in the process of converting to nanotech processes and products." "Self-Assembly is an economical method for assembling precise structures of molecules in a pre-defined way. Once initiated, the self-assembly process assembles trillions of components, such as molecules, into integrated structures that have specific functions." "Nanotechnology will completely redefine the means of production. When we reach a level of nanotech whereby we are capable of building any structure out of its raw atoms, then capitalism, or the concept of 'ruling elite' or concepts of 'work' or 'money' will not survive. Everybody will have access to the same amount of resources as a multi-millionaire. ... When having in-body nanobots becomes commonplace, people won't need doctors any more." "Internet Opens Elite Colleges to All"